Six months is how long it takes for new hires to decide to stay or go, says a study by Aberdeen. The other big news—folders and traditional orientation are old school. Today's new hires expect more—an understanding of culture, connections with peers and an experience as up-to-date as the technology they use every day. First impressions with your company matter, both for your new hire and what they’ll share about your employment brand. 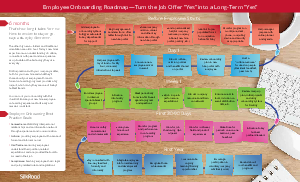 A formal onboarding programs provides a big impact, which is why they are one of today’s hottest trends.